YOU know the way children declare that they "just can't wait for Christmas" (or Easter, or take your pick). Myself, I have been looking forward with similar eagerness to the new instalment of the American version of 'House of Cards'. The British original was one of the cleverest and most exciting series ever to appear on television. It centred on the skulduggery practised by the wicked Francis Urqhart, played by Ian Richardson. It peaked with Urqhart murdering a young journalist by throwing her off the House of Commons roof. When I was a schoolboy a very long time ago, we learnt about dreadful events in olden times. Grand folk certainly did not draw the line at murder. Lately King Richard III has had his reputation somewhat restored, along with his mortal remains, but he is still the prime suspect for the murder of his little nephews, the Princes in the Tower. The implication, if not outright assurance, was that such things happen no longer. But they do. At best we can assume that in the more imposing countries murder, torture and so forth are left to the security services. The conduct of politicians is more gentle but not much more laudable. Government whips – Urqhart was portrayed as a Tory chief whip – gather damaging information about ministers and backbenchers. They use it to force them to support dubious government decisions. They threaten them with the loss of their careers. The victims usually cave in. But many viewers flinch from the sight of too much violence and ruthlessness. Enter, therefore, that milder masterpiece of television politics, 'Yes, Minister'. 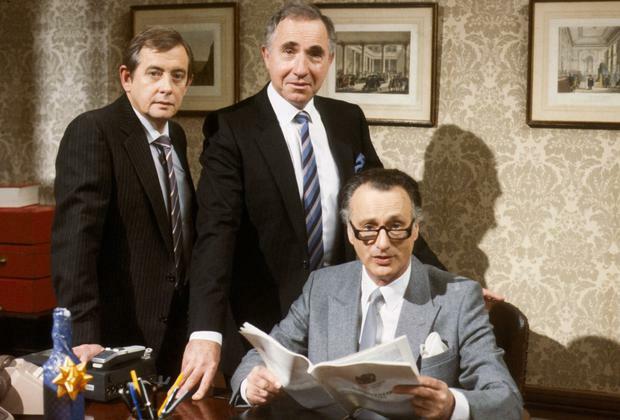 'Yes, Minister' showed Sir Humphrey Appleby, permanent secretary of the Department of Administrative Affairs, manipulating his minister, the nitwit Jim Hacker. His silken politeness and superior intelligence always convinced Hacker that their interests were as one. And what about the public interest? Sir Humphrey had an answer. It was in the public interest that civil servants should rule the United Kingdom. It was utterly convincing because it was so close to the truth, and not only in Britain. I once found myself part of a lively, loquacious company which included Brian Lenihan senior and Albert Reynolds. They both called the series "terrifyingly accurate". Lenihan afterwards wrote an article in which he asserted that "there are no Sir Humphreys in Ireland". That's politics. I did fret a little over a scene in which Humphrey and the cabinet secretary plotted to make Hacker prime minister. He faced opposition from much more formidable candidates. But hints of the disclosure of former little mistakes in financial and sexual matters soon persuaded them to leave the race. Would men with first-class brains and real concern for the public good conspire to put a ninny like Hacker in 10 Downing Street? And could such things happen in Ireland (save the mark!) or in the United States, the home of Watergate and Cigargate? Will we see Kevin Spacey, the star of the American series, embroiled in more scandalous events than any in Europe? I fancy that we will. After all, in the recent movie 'Lincoln' we saw one of the most admired leaders in history organising a distasteful scheme to ensure the passage of a bill. Mind you, it was a very good bill. Designed to serve a noble cause. Aren't they all? The martyred Abraham Lincoln has a successor of sorts in Barack Obama, who seeks to emulate him. Maybe he still can. He has beaten the Republicans in Congress on the issue of the "debt ceiling". What pressures were brought to bear on the intransigents? Were any of them reminded of little incidents in their past lives which they would prefer to keep secret? And what pressures operated behind the overnight coup in Italy? Maybe the answer is simple. A decent but rather dull man, worn out by the burden of office after just a few months, gave way to a dashing youngster. Or maybe it's not so simple. Maybe the spirit of Silvio Berlusconi, and the Italian genius for political self-destruction, live on. If an Italian television station – not one owned by Berlusconi – took up the theme, it would no doubt play it as satire. In Ireland, the style would of course have to be tragicomedy. The English mix smoothness with a bitter aftertaste. But nobody can beat American humour at its best. Perhaps the new series will be even better than the old. Like 'Godfather II', but in a different mood. I really can't wait.